The Superhero League of Hoboken! 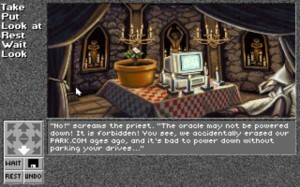 SLH is a quirky little comedy game mixing elements of point and click adventures and standard RPGs. The basic premise could best be described as a mix of Mad Max and Mystery Men – you are one of many regional superhero clubs doing your best to put an end to intentionally odd acts of villainy (like a limburger cheese car bomb, or genetically engineering a tree that sheds its leaves only after the yard has been raked). Your guild is likewise comprised of heroes with seemingly useless superpowers, from the ability to see the contents of pizza boxes without opening them, to King Midas, who can turn anything he touches into a muffler (get ready for some incredibly dated, awfully American, but overall hilarious jokes). As The Crimson Tape – master of organizational charts and new leader of the SLH – you must guide a party of heroes out into the Jersey wastelands to set right these wrongs, earn points and experience for doing so, and thereby earn enough prestige and new members to become the top superhero league in the country. 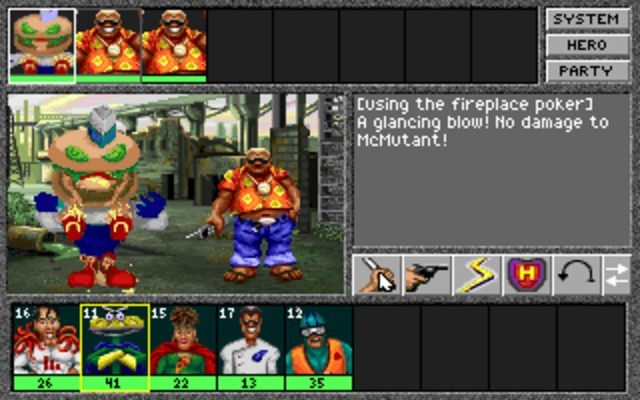 The game is broken into seven chapters, with up to six missions each. After downloading missions from your base computer and heading to the lunchroom to select your party, you head out into the RPG overworld map. This is a grid map divided into sectors, with missions given in X,Y coordinates. You uncover the map as you travel through it, and certain areas (radioactive zones, hills, water) require special abilities before they can be tackled. Most of the map is barren, but you will occasionally encounter a village or marketplace where you can stock up on items, better weapons, or stronger armor. You’ll also hit random encounters here (with enemy strength in the area tracked by a “dangerometer”), which takes you to a traditional RPG fighting screen where you deploy weapons, tactics, or superpowers to best your attackers. After about five or six random encounters, you’ll have cleared out all enemies in the sector, made that area safe for future travel, and earn buku experience points for doing so. As you scour the overworld, or reach your mission destination, you’ll encounter structures you can enter. Here, the game switches to an adventure format with a first-person view and standard look/take/open commands on the side. Items are collected from other similar locations and dispensed here to solve very simple puzzles. Though the situations are certainly off the wall, the solutions are fairly obvious. A transmitter controlling a fleet of pooping pigeons is defeated by interrupting the signal with a stronger transmitter. The aforementioned limburger bomb is simply dissolved with a clearly-labeled vial of “cheese-eating microbes.” And a warehouse full of mutated tamales is easily consumed by the Iron Tummy, whose superpower is to eat spicy foods without distress. Nothing particularly subtle. Clean the overworld’s random encounters, and they’re gone for good. THANK YOU! There’s really not too much to complain about, and the genre-blending works well. I hate random encounters, but they’re pretty painless here. The reward for defeating all enemies in a sector (both in XP points and in clearing it for good) is certainly worth the relatively few fights it takes to achieve it, and you’re uncovering the map while you do it. Combat freely allows you to run away if you’re outnumbered, with the only cost being a random chance to drop an item. You can even beg and bribe your opponents if you’re really in trouble. Reviving knocked-out party members is simple too, with a “rest” option available anywhere in the overworld that brings all members back to full health. You have a limited amount of rests before you must return to your HQ to restock your supplies, but that’s as inconvenient as it gets. Missions aren’t overly tricky to figure out, and the grid coordinates mean you don’t have to hunt around to find their locations. I feel like any harder-core RPG elements would seem out of place with the lighthearted, comedy slant at expert play here. The only issues I really have are relatively minor. The overworld map uses small tiles to represent the terrain, and it can be confusing to see where a marketplace or mission area actually is. None of them are highlighted on the map, and you have to really look to make out their somewhat-distinct tile icon. This ultimately means that you may have to search around trodden ground to find an entrance again. Also, in fitting with the zany style of the game, weapons and armor are homemade objects or strange creations of dubious practical value (like an asbestos fanny pack). It’s almost impossible at a glance to determine if a paddleball set is supposed to be a stronger weapon than a plastic boomerang. A “look” function in the hero menu will give you a numerical value of the items effectiveness, and each hero auto-equips the best applicable item they have, but it requires a bit more menu-wrangling than it should. Again, minor quibble. The enemies are just as absurd as the premise. The game looks great, and the mishmash of concepts comes across clearly in the art’s style. Run-down villages and patchwork civilians give a clear idea of a broken humanity trying to rebuild, while the costumes and character portraits for your heroes look appropriately gaudy and absurd. Enemies are creative, satirical twists on the familiar (robotic Richard Nixon, anyone?) You’ll also get to see ruined versions of New York landmarks in the adventure sections, from Times Square and the Empire State Building, to Edison’s laboratory and Yankee Stadium. All are skillfully drawn and look the part. Similarly great work on the audio side. While the floppy release commonly floats around on abandonware sites, and offers but the bare essentials, you want to put in the mouse clicking time to track down the CD version. Not only do you get great battle effects and background music, but every piece of spoken dialogue (including enemy taunts and cries in combat) gets fully voiced. There’s no narrator reading the text descriptions, but the amount of work put in to record individual dialogue for each spoken line is commendable. Voices all around are fantastically cheeseball, and pretty much right on the money each time. Oh, they’re bad, but precisely the right amount of camp for the job. Now be aware that the CD version is NOT worth the $200 collector’s price it frequently carries on EBay, but is definitely the version of choice if you can swing it on the cheap. I wasn’t sure what to expect going in, as games that try to be this overtly screwball usually fail at the attempt. Instead, SLH manages to not only be an excellent game, but a legitimately witty and pretty hilarious story as well. It combines genres skillfully, is challenging without being frustrating, and its incredibly dated jokes completely reward those who get the references. On your way, Crimson Tape! Hoboken needs you! Excellent adventure/RPG hybrid. Humorous and laid-back. Nice voice work on the CD release.